Lara Croft (Alicia Vikander) works as a bicycle courier on the streets of London, while keeping herself physically fit at a boxing gym. Although she struggles to pay her gym fees, Lara is actually incredibly wealthy. However, because her father, Lord Richard Croft (Dominic West), has gone missing on a quest, she doesn't want to sign the papers that would declare him legally dead, even though it would gain her access to a lot of money. When she's pushed to sign the papers to his global empire, Lara discovers a clue in a puzzle and sets off to find finds her father on the dangerous island where he disappeared. 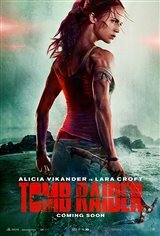 With the help of Lu Ren (Daniel Wu), whose father also went missing seven years earlier, Lara travels to the island, located just off the coast of Japan, which holds the ancient tomb of Queen Himiko.